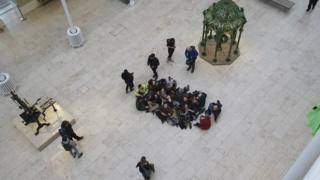 Police have arrested 13 people in Edinburgh after a group of protestors staged an occupation of the National Museum of Scotland. Twenty activists entered the museum as the Scottish Oil Club prepared to host its annual dinner there. The protestors from Extinction Rebellion occupied the main hall in an attempt to force the dinner's cancellation. Several had chained themselves on to railings inside the historic building. The group dropped a banner from the balcony of the museum. Police moved in to remove the activists when the museum closed and they refused to leave. The group claimed to be holding a "peaceful people's assembly focusing on the damage done to the world by the fossil fuel industry." A Police Scotland spokeswoman said: "About 16:30 officers in Edinburgh were deployed to a pre-planned protest at the National Museum of Scotland in Chambers street. "At close of normal business some protestors refused to leave the main building. "Following a period of negotiation police provided a proportionate response to the protest and 13 people, a mix of men and women, have been arrested.